Looking for an Acura MDX for sale in Lynnwood Washington? Then look no further, Carson Cars has a great selection of quality Acura vehicles for sale at competitive prices. What does the Acura MDX have to offer? Comfort! Great lines! Well engineered! Flawlessly built! – These are just a few of the words that describe the Acura MDX. The MDX was introduced in 2001 and has consistently been winning awards for style, innovation and safety ever since. 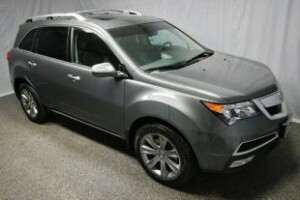 Few other brand SUV models can rival the luxury and performance of an Acura MDX. The standard equipment on this vehicle includes all important safety equipment, power everything and a guarantee from Carson Cars. Call Carson Cars now to arrange your test drive of an Acura MDX: (425) 697-6969. If you are looking for a premium Sports Utility Vehicle, Carson Cars in Lynnwood, Washington (map) has a number of Acura MDX SUVs for you to choose from. Mike Carson is the second generation of the Carson family operating Carson Cars. As your neighbor and member of the community his primary interest is in making sure that his customers are satisfied that the deal they get from Mike is fair. Every car that is sold at Carson Cars undergoes an intensive inspection. Every car sold by Carson Cars comes with a guarantee. Call us now at (425) 697-6969. Since 1968 area residents have come to Carson Cars for the best deals on pre-owned cars. We can help no matter what your credit situation is. If you have your heart set on a great deal for Acura MDX with a guarantee call now: (425) 697-6969. Carson Cars also has extended service plans for you that are affordable and will give you the assurance you want that your car will always be cared for correctly. Don’t forget, for car repair we offer pick-up and delivery service or a free loaner car! Carson Cars is a proud member of the National Independent Auto Dealers Association and a winner of its Auto Dealership of the year award. Acura makes one of the world’s finest luxury lines of automobiles available in the world. These cars are rugged and built to last. Call us at Carson Cars to speak with one of sales staff about one of our Acura’s For Sale In Lynnwood (425) 697-6969.